Grouping of businesses based on their primary business activity. Industry classifications are based on the North American Classification System (NAICS 2 digit classifications). Manufacturing reflects NAICS codes 31-33, Retail Trade reflects NAICS codes 44-45, and Transportation reflects NAICS codes 48-49. Age ranges reflect those collected and reported as part of the Quarterly Workforce Indicators (QWI). 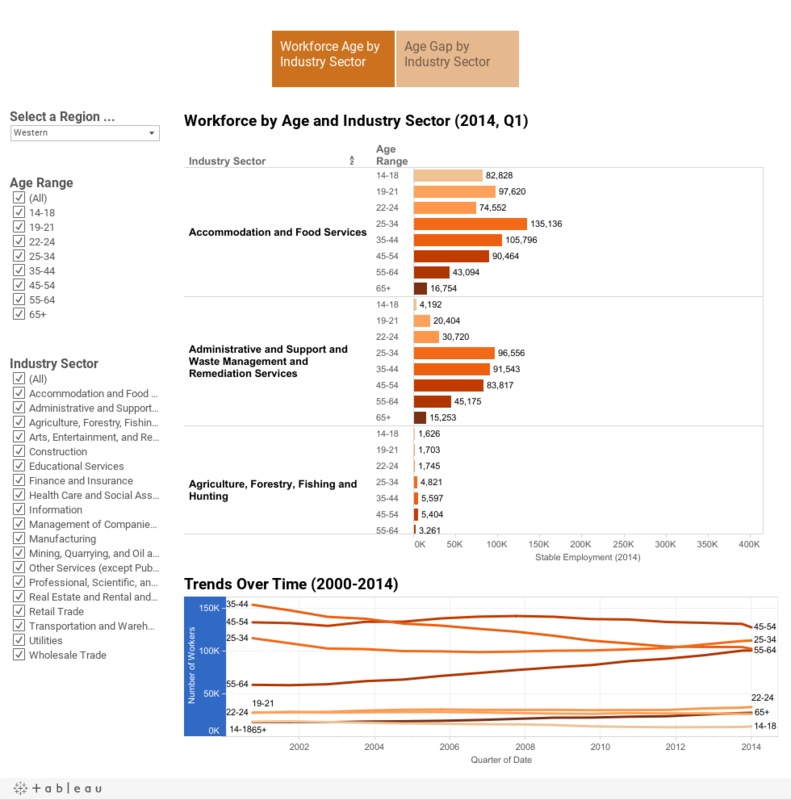 The Age Gap by Industry Sector tab addresses the difference between the number of workers who will reach normal retirement age over the next 10 years (age 55+) and the number of younger workers (age 25-34) that will need to fill vacant positions. The gap sheds light on industries that may face potential shortages in workers unless they can attract larger numbers of younger workers. Workforce numbers for 2014 reflect the first quarter of 2014. Annual averages are provided for all other years shown. Data Source: U.S. Census Bureau. Quarterly Workforce Indicators (QWI). This entry was posted on May 7, 2015 .